Family meals out can be full of stress or they can be a lovely way to spend quality time together, away from technology and the washing up! One of the key factors to the level of enjoyment is how family friendly the restaurant is...Are there baby changing facilities? A children's menu? Fun activities to keep the children entertained? Family dining offer? Plenty of highchairs? Giraffe World Kitchen has all of this and more, while offering a delicious menu for us adults too. Tasting new flavours is the focus of their menu, with lots of dishes from around the world to try. There is anything from tapas to huevos rancheros and tagine to burgers, therefore catering for all of the family. As a family we really enjoy going for meals out because it is quality time together, away from work, technology, distractions and we all love our food! Isabella is such a big eater and always has been - toddler's seem to be a bottomless pit when it comes to food, don't they? The Giraffe World Kitchen Kids Menu takes this into account offering generous portions, a wide range of dishes for each course and plenty of drink choices. They have breakfast options including pancakes, mini brunch and porridge, which I know would all be a hit with Isabella. Even Poppy would have her eye on the pancakes and porridge! When it comes to main course they have a sunshine salad, chicken wrap, chicken curry, quesadilla, fish & chips, sausage & jacket wedges, beef burger, katsu chicken and pasta al pomodoro. On to Isabella's favourite course...dessert, which includes chocolate brownie, strawberry & banana lollipops, churros and ice-cream. All winners with children and you get a main, dessert and drink for £6.50 all day every day. Children are also greeted with an activity pack to keep them entertained, so you can try and relax. But over Easter kids eat FREE! The perfect excuse to enjoy the extra time you may have together thanks to all of the bank holidays, eat delicious food and be looked after by the friendly staff at Giraffe World Kitchen. We were kindly invited along for a meal and we were once again impressed with the outstanding service, delicious food and beautiful surroundings. We visited the Birmigham branch, which is in the stunning Grand Central Station right in the heart of the city centre. The ideal location for taking a break from shopping or if you're using the train to get to/from Birmingham. There are also lots of fantastic children's days out in the city centre, including Thinktank and Sealife Centre. To start we had the Nachos Nirvana and Garlic & Rocket Flatbread, both of which were delicious. The nachos came mounded high, so were perfect for sharing and the flatbread is also a really good size. Isabella enjoyed a slice of the flatbread with the 'green leaves' removed - what is it with children and salad?! For our main meals I went for the Kati Roll, which is a chickpea and cumin roasted cauliflower curry (very mild) served in a naan bread with yogurt, pomegranate seeds and chutney. It was seriously flavourful and it was so nice to have a bit of a different vegetarian option to choose from. My husband went for The Ultimate Giraffe Burger, which he said was very flavoursome, juicy and messy to eat! They're the best kind of burgers in our experience. Isabella opted for the Breaded Fish Fingers with Chips and Beans (it can also come with sunshine slaw and cucumber), which she wolfed down in a matter of minutes. It was the perfect portion size for her and we were given the option to either have it come out with the starters or main courses. It's that attention to detail from the staff that really impressed me with Giraffe. When it came to dessert we were all feeling pretty full, but the dessert menu wasn't one we could give a miss. I went for the Whoopie Cookie, which was speculoos biscuit ice-cream sandwiched between two chocolate cookies topped with pretzels, chocolate sauce and popcorn. I mean, what can I say? It was absolutely divine. My husband had the Salted Caramel Sundae, as he's a caramel addict. Layers of salted caramel ice-cream topped with pretzels and popcorn was a winner with him. Isabella went for a children's vanilla ice-cream, which is her absolute favourite 'treat' pudding, so she was in her element. It was a lovely way to spend a Sunday together, so we'd highly recommend making a visit during the Easter Holidays when the children eat free! Have you eaten at a Giraffe World Kitchen before? *We were given a complementary meal in exchange for this blog post, as always all opinions are my 100% own and honest. Available all Easter holidays. One free kids meal deal (main, selected drink and dessert) per full price adult main purchased. Offer available at UK restaurants excluding Southbank, Victoria and airports. Voucher must be present upon ordering. One voucher per group of up to 6. Voucher is not transferable and there is no cash value. Giraffe reserve the right to change this offer at any time. I'd never heard of Giraffe World Kitchen before, but it sounds great. I'll have to check if there is one near us. Oh wow! This place sounds incredible. My kids love going out for meals... We need to do it more often to be honest. Thanks for this, I’ll definitely be taking B over Easter! Just checked because I was sure I’d seen it, and there’s one in the centre of Leeds. Perfect! I love Giraffe! Amazing that the kids eat free over Easter! We love Giraffe. Been to the one in Manchester a few times. 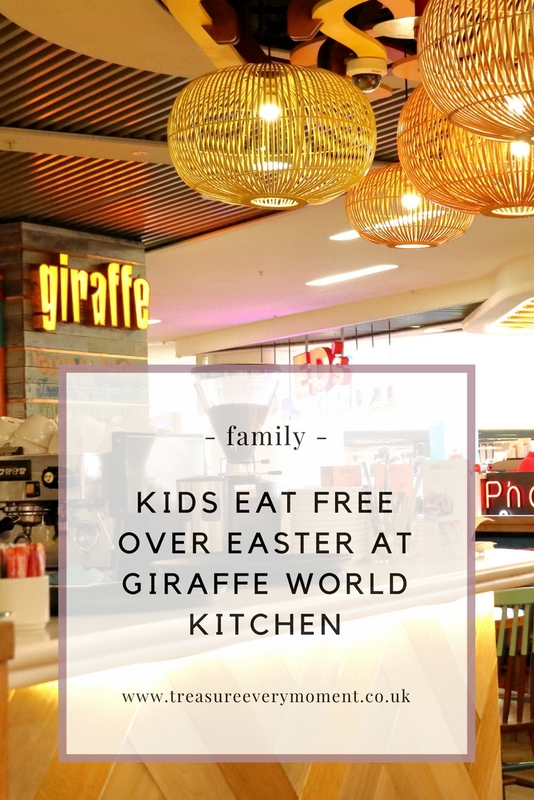 I haven't come across Giraffe World Kitchen before but it sounds like a great place for a family meal. And that's a brilliant deal to have going on over Easter! I've heard Giraffe is a great family friendly place I'll have to see if they're one near us! I think I have heard of Giraffe World Kitchen before but can not think where. It might be Meadowhall or Nottingham, not sure but we will have to try and visit as the food looks amazing :) Looks like a special treat. Akthough I am not a child - Giraffe world sounds so much up my street I might just take my sisters one weekend to check it out! The food loks absolutely amazing! This is one place i havent visited yet but we will def check it out over easter! I've never heard of these - now I'm on the hunt for one, we'd love it! Eater holidays, here we come! What a great deal and a gorgeous place to eat. I wish we had one of these near us, I'd definitely visit. This all looks so amazing - I'm definitely hungry now though! We have a Giraffe really close to us but have never given it a go - I definitley want to after reading this!